Low-sheen images of our well-lit national monuments with Wish you were here, scrawled on their backsides? Maybe. 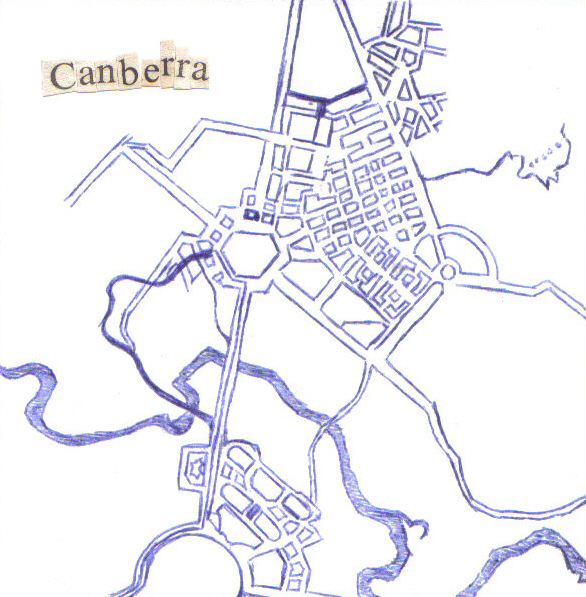 Canberra postcards are alright. The plans for each meticulously aligned construction were surely accompanied by optimum vantage points, so that the experience they provide might be captured from its most monolithic angle, crowned with saliva and stamp, and mailed to your aunt. It’s a different thing altogether to look at these when you live and have lived here. This is not where I am from, you’ll think. Nor can I wish you to be here, when all you think to here is this: a triangular flagpole, a body of water built by human bodies, endless symmetry and neck-craning views. Built for serious business or built for visitors, those postcard places do not belong to us. Postcard Canberra makes a sense of pride for these institutions – that characterise the image of our home as fed to tourists – veritably difficult. This may be a blessing in disguise: feelings of disconnect from the notion of ‘home sweet home’ and the parliamentary triangle provide us with a clean slate. We have the ability to create spaces that do belong to us, that feel special because we recognised them to be and made them so. Also of great import in our fresh start at a culture – because of an oft-proclaimed ‘lack of culture’ – is that we share these spaces. Though a vision of a government advertisement capitalising on/exploiting an ‘alt’ or ‘underground’ Canberra – a slideshow cross-fading between your secret coffee spots and pop-up shops set to synth-driven muzak and broadcast on the parliament channels – is a horror that may await us, a culture marred by protective exclusivity is ultimately a more frightening prospect. Our secret spaces needn’t be any kind of conventional cool. Those standards have been set by other cities, other people, and are less interesting as a result. It’s perfectly valid to take ownership of places that are existing, their specialness as-yet unrecognised, uninstagrammed. Thoroughly non-postcard spots are the ones that will get you closer to the Heart of What Canberra Is. If the idea of a Heart of Canberra makes you cringe, then it’s these places that you must seek out. In the spirit of sharing, I’ll present to you three of my favourite non-postcards, none of which have gift shops. An elevator can take you as far as the top level of the carpark. Walk around the corner and you’ll be met with a metal gate door. Watch for cars and security guards that might be watching you. Make sure you’re wearing shoes that are small and strong, because you’ll need to heave yourself up, wedging and gripping until you can swing your legs over the top. One heel on top of the padlock, you can lower yourself down a little, but after that you’ll have to jump. You’ll be okay. A forty-centimetre-wide boardwalk built for maintenance crews rewards you, a helpful guide to traversing the green aluminium, up over one more ledge and to the roofs. The views aren’t here yet, so you can focus on your feet and follow yourself as you move along one foot after the other, gradually gaining speed, a character in a video game. Soon you’ll be directly below the sun, reaching a height where the wind can bother your balance. It’s time to go off the boardwalk. Turn out your feet and balance your arches on top of each corrugated ridge, you’ll feel wobbly but the roof won’t make the yelps that threaten giving way beneath you. Head towards the edge, and don’t mind the bird skeletons gone driftwood-white in the sun. Once you’re there, feel free to have a seat. You’ve scored yourself a prime birds-eye view of Garema place. You’re not really allowed to be here, but don’t worry, nobody will see you, because nobody looks up (how often to we really look up?). The trees look different from up the top and so do people. Count bald patches. Count instances of people attempting to walk around each other and both going the same way. When you’ve had enough of looking down, go ahead and look up into a probably cloudless blue. While there are many things to be thankful for in the newer models of action buses, such as the blue fluorescent lighting that renders human skin alien, and the amusing yellow noose-like handholds. However, I continue to mourn the loss of the People Watching Seat. Located at the front of the bus, the People Watching seat is the seat in the four-seaters that face backwards to the direction that the bus travels, so that you can watch yourself soar away from your original position. More importantly, it’s facing forward and facing into the faces of your 50-odd co-passengers. Look at the people looking out the window, thinking about what? There’s one man smiling at his phone as he texts. You hope the woman falling asleep doesn’t miss her stop. A round woman in dressed in pink exercise gear speaks aggressively on the phone, but then mentions that there is chicken in the freezer for dinner, and I love you. If civic interchange were a person, these spaces would be the tiny crooks and nooks that nobody sees and where the skin is soft, like the inside of your elbow, or behind your ear. In-between spaces that you only see in-between moments are the best kind of visual hiccup, a sudden view of intimacy that disappears as quickly as it came. You can venture down these narrow belts where buildings meet buildings, dumpsters kiss dumpsters and wires graze each other in criss-crossing pattern but I prefer to walk past and let my mind fill in the rest. These three non-postcards all come from the Civic region, and I don’t doubt there are many more across this bean-shaped territory. If you’ve got non-postcards of your own, I encourage you to share them in the comments, so we can turn this into a Thing, something to scrawl ‘wish you were here’ on the back of. Joanna Pope is a Year Twelve student looking forward to commencing Life In The Real World next year, hopefully 16,061 kilometres away, in Berlin. It is on this threshold of change that she has also finally come to appreciate her home of Canberra and its particular breed of the secretly (or inadvertently) cool.